Often, recipes call for a certain amount of cooked chicken or some other kind of meat and it's such a pain to have to cook it each time. Wouldn't it be nice to just pull a bag of cooked meat out of your freezer and thaw it quickly? Bulk cooking is such a time saver. You can cook up a huge amount of meat in a short time and fill your freezer instantly with enough packages to last you a couple of months. Just think, a couple of months without having to cook chicken for casseroles, chicken tacos, chicken burritos BBQ'd chicken sandwiches, etc.. This can be done with hamburger meat as well. Just think how easy making tacos would be, or Sloppy Joes. Give it a try! You begin with a large purchase of boneless, skinless chicken breasts. You can do this with chicken on the bones, but it's much more work. You have to weigh out the cost of one way versus the other for yourself. I personally like the ease of boneless, skinless chicken. If I were really on a tight budget, I'd do the work on the bone-in chicken to save money, but there would be less yield. First thing in the morning, fill the crock pot with chicken as full as you can while still being able to close the lid properly with a little room for seasonings if you choose to use them. If adding salt (optional), mix it into the water and then add. Cover. Set on HIGH for the first 2 hours. Turn to LOW after that and let the chicken cook until evening. 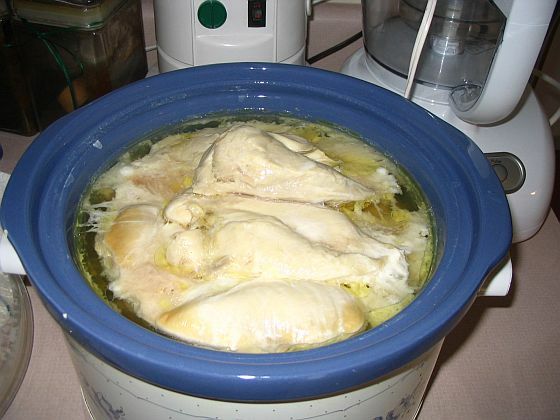 Once the chicken is done, turn off crock pot and drain chicken in a colander. Catch the liquids if you want to use them as chicken broth. Put chicken in a large bowl to cool before shredding. 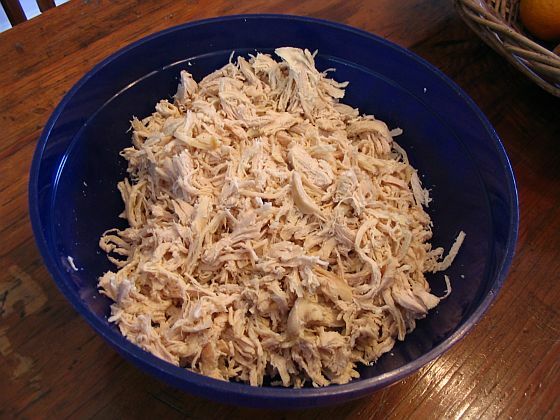 Once cooled, sit yourself in a comfortable place (I sit at the dining room table) and begin pulling the chicken apart in shreds, keeping all chicken inside of bowl (shredded and non). Remove bones and gristle at this point if you're using bone-in chicken. Take great care to remove all bones. 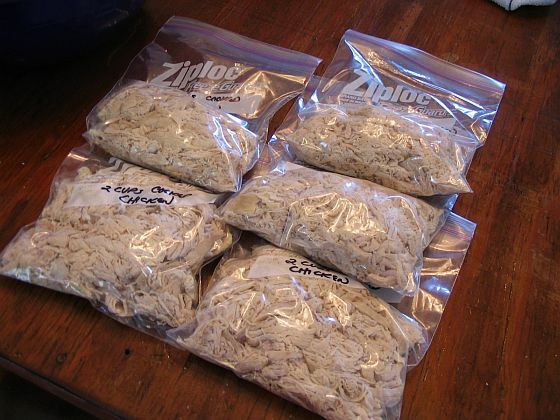 Once it is all shredded, label at least 5-8 freezer bags with something like "2 cups cooked chicken". 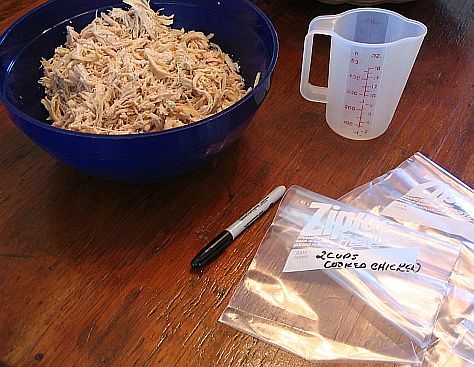 Begin measuring chicken into the 2-cup measuring cup and fill each bag with 2 cups of chicken shreds.